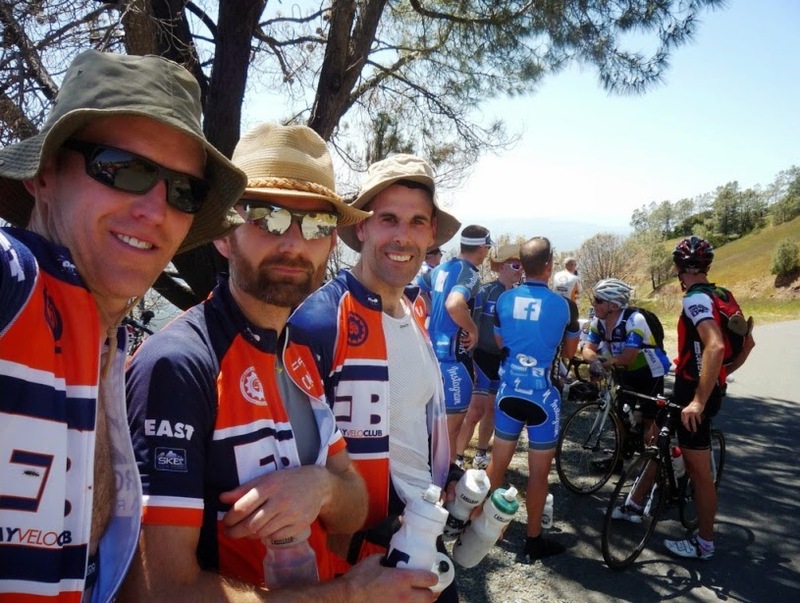 This tale, written for my bike club pals but also for you and your closest confidants, concerns a very special journey up Mount Diablo to watch real professional cyclists tackle the “queen stage” of the Tour of California. Due to the soporific effect of hackneyed phrases like “chess game on wheels,” “burned too many of their/my matches,” “a picture of pain,” “riding like a man possessed,” and “turning himself/myself inside out,” I will not describe the riding (mine or the racers’) in much detail, but—in keeping with my club’s fine literary tradition—will focus mainly on the food. Two words into the short version of this tale, I may have already ruffled some feathers: Ian, who hosted a glorious breakfast for our group, must be wondering why anybody, even a glutton like me, would have a pre-breakfast. After all, in an e-mail to the group he’d written, “I will of course be making a separate batch just for Dana.” So it’s not like I had to worry about the food running out. Besides, as I mentioned in my 2012 Tour of California Mount Diablo report, I don’t normally eat breakfast at all. So: why two breakfasts? Well, it’s complicated. First, there was the matter of the Bolognese left over from Mother’s Day, when I spent four hours making a triple-batch as a peace offering after a) having neglected to make any restaurant reservations, and b) having suggested to my wife a restaurant that wouldn’t be packed on Mother’s Day (i.e., Hooters). Now, if you’ve ever had a proper Bolognese (i.e., one that is a solid once refrigerated), you know that this sauce is almost impossible to resist under any circumstances, even with the knowledge of an imminent pancake breakfast. Even when bacon is involved. What is “zested Parmesan,” you might ask? It’s Parmesan grated with a zester (see above photo) so it melts like snowflakes on your pasta. The plan was for me to meet Sean and Ryan at the coffee shop, and then we’d ride to Lafayette to meet Craig, who knew the way to Ian’s. Well, I was so late getting to the coffee shop, I got angry voice-mails on both my mobile and home phones. I didn’t want to add insult to injury so I didn’t even explain myself at the time. So I will now. I was actually only six minutes late to the coffee shop, but Sean and Ryan seemed pretty stressed. I guess that’s because I alone knew how to get to the trefpunt, and I alone knew what “trefpunt” meant. (In English it’s “rendezvous.” Wait. French. Whatever.) So after I assured them we had plenty of time, we moseyed socially along until we actually were running late, so then we got to do some real hammering. Man, I love real hammering, especially on the flats, because I never do anything but climb and seldom have anybody to draft. We ended up reaching the trefpunt six minutes late, which was fine because Craig was running late himself. We rolled in to Ian’s unfashionably early. It was already getting hot. Due to Ian’s brilliant pancake breakfast concept I changed my fueling strategy radically. That is, I didn’t bother bringing any food on the ride, foregoing the sandwiches etc. I’d schlepped in a backpack last year. You might think this is foolish since pancakes have a pretty high glycemic index (i.e., they burn rapidly), so my blood sugar could crash after just a couple of hours. But bacon and sausage, being high in the right kind of fat (i.e., the chewy kind) have a very low glycemic index. In fact, gristle probably has a G.I. of about 1. And low-G.I. foods slow down your burning of high-G.I. foods. This is why a big carnitas burrito obviates the need to eat for at least twelve hours. Dang it, I’m making myself hungry here! Anyway, I tried to keep track of the number of sausages I ate, but could not (though it was at least ten). Ditto the bacon and hotcakes. I tried to spam that last photo out to all my followers on Twitter, Facebook, etc. and it probably would have worked fine except I decided to get fancy. I figured, hey, Ian’s great food will probably get me a whole bunch of Likes, but couldn’t I get even more Likes with a really nice stock Getty image of a visually perfect stack of pancakes? Alas, between my fingers being greasy from the bacon, my smartphone touch-screen being fogged up, and my skills being rather poor to begin with, all I managed to do was send the photo to my Paypal account, which they’ve now frozen. That whole last paragraph? Yep—pure fiction. I’m not on social media, beyond this blog. The ride was very hot—temperatures in the 90s by the time we left Ian’s—but not all that hard due to our conversational pace. Full disclosure: I was technically blood-doping for this ride. Last week I donated blood, which normally is okay from a sporting perspective, but in this case it was platelets and plasma, so I got my red cells back. Since having blood return to my body is technically a transfusion, I guess I was technically in breach of the rules and I really wonder what my blood passport would look like if the UCI did one for me. But I’m not going to be one of those riders who, when finally admitting guilt, takes down a lot of other guys with me. So from this point forward all the names of my fellow biker/spectators will be redacted in my report, following the example of the USADA rider affidavits. Otherwise you might think them complicit in my transgression. That wasn’t the only time a complete stranger joined our conversation. Another time, we were trying to remember at what elevation the officials closed the road to VUPs (Very Unimportant People), and someone helpfully said, “It’s at 3,848 feet.” Wait, did I just say “helpfully”? Well, I lied. This comment wasn’t that helpful because that’s the elevation of the summit, as we already knew, not the info we actually needed. But it was very nice of the fellow to try to help and I wish him well. Here we are maxin’ out while the racers made their advance toward the mountain. At least half a dozen big vans drove by, toward the summit, with absolutely nobody in them. I’m sure there was a point to this but I’ll be damned if I know what it was. And damned if I don’t. After a very long wait in the open-air sauna, we finally saw the official vehicles, then some motos, and the leader of the race. We had no idea who he was but it didn’t matter. Half a dozen seconds later came the lead group, with Sir Bradley Wiggins right on the front. Despite setting a blistering pace, Wiggo looked not only more comfortable than we had pedaling our casual way up the mountain, but more comfortable than we felt just watching the race. I think he was breathing only through his nose. Note to self: abandon tentative plan to turn pro. The peloton was in pieces. Lone riders came by here and there, and small and large groups. Tom Danielson rode by, well off the back, and [Spectator 4] yelled, “Hang in there, Tom! I know it’s not easy when you’re clean!” Indeed, he did look a lot, uh, cleaner than in past years. Then [Spectator 4] set up an empty water bottle with a $5 bill sticking out the top, as an ad hoc crowd prime. If the cyclingnews start list is correct, it was the Dutch rider Danny Van Poppel who wheel-thwacked the bottle off the road, to our great delight. The final racers trickled by, then the broom wagon, and then the show was over and we made our way down the mountain. It wasn’t nearly as clogged with biker-spectators as last year, perhaps due to the heat. I rode hard all the way home, part of the time with [Spectator 2] and [Spectator 3], and though I didn’t tackle my beloved Lomas Cantadas (the heat was still in the upper 90s and it had been a long day) I did feel a moment of pride when I made it over the so-called “I hate pain” hill (on Wildcat Canyon Road, by the Brazil Building) in the big chainring. It was only a moment of pride, though, because then I remembered that my so-called “big ring” is actually only a 50-tooth because, uh, well, I’m riding a compact these days. When I got home I presented the sunglasses and micro-jersey to my daughters, and instantly achieved hero status. Lindsay knew right away what to do with the jersey. The jersey could use some tailoring but I think Ken looks great in it. All those Barbies are going to be fighting over him! Note how closely he’s shaved his legs. I’ve already listed off my assortment of post-ride sugary snacks. After those I did some cheese grating duty as my wife put the finishing touches on the aforementioned spinach-and-meat lasagne. The Brassica oleracea var. gemmifera weren’t quite done yet so they came out as a second course. Anyway, even that course was pretty tasty. It was a great dinner after a great day, and my lips, for once, hadn’t even gotten sunburned. Life is good! Velominati's “The Rules” - Brilliance or BS?